The Racine Zoo is proud to partner with the Monterey Bay Aquarium Seafood Watch® Program to help sustain wild, diverse and healthy ocean ecosystems that will exist long into the future. As a conservation outreach partner, we are working to educate area businesses and organizations on serving only environmentally responsible seafood and promoting sustainable seafood within our community. We are not suggesting you stop eating seafood, just asking that you make educated choices with the environment in mind. The Monterey Bay Aquarium Seafood Watch® program empowers consumers and businesses to make choices for healthy oceans, helping support diverse marine ecosystems for the future. Using science-based, peer reviewed methods, Seafood Watch assesses how fisheries and farmed seafood impact the environment and provides recommendations indicating which items are "Best Choices," "Good Alternatives," and which ones to "Avoid." 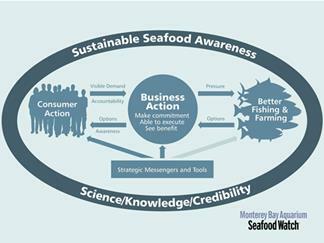 Seafood Watch raises consumer awareness through its pocket guides, website, smart phone and tablet application, and partnerships with businesses, zoos, aquariums and culinary leaders. 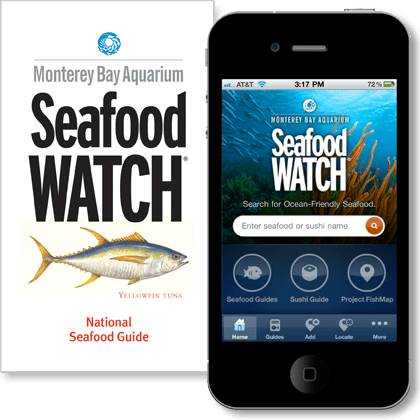 Seafood Watch has distributed more than 45 million Seafood Watch pocket guides since 1999 and their free app has been downloaded more than one million times. This 15-minute film explores the last wild hunt on our planet—our quest for seafood. Please visit seafoodwatch.org for more information. Use your smartphone to make smart seafood choices on the go. The App provides recommendations on ocean-friendly seafood and sushi, provides alternatives, and let's you search for businesses who offer sustainable seafood.